KitMonsters – Ty. The music makers’ guide to making music. Ty is a UK hiphop legend, his second album Upwards was nominated for the Mercury Prize, and he has put out two incredible EPs this year. Kick Snare And An Idea Part One and Part Two explode with beautifully crafted and vital tracks such as Like You Never. Ty’s long-term musical co-creator is Drew Horley and we were stunned when we visited their studio, to see a collection of amazing and rare vintage synths. They don’t just use samples, but lovingly build the sounds and grooves they need, enlisting jazz supremos and other rappers along the way. 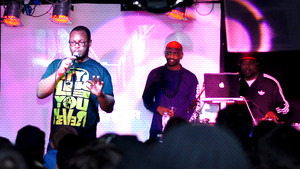 Ty has worked with De La Soul, Tony Allen, Estelle and Arrested Development, and more recently with Akala and Durrty Goodz. Ty’s lyrics are famous for being pithy, playful and precise and he’s praised for his ‘lyrical frankness’. Ty is touring Germany and Switzerland soon. Ty and Drew have been working together for years, bringing a mix of talents to the table. They both produce, and Drew plays amazing keys. Ty says they spend a long time perfecting each track, and their nerve centre is The Lab Recording Studio in London. What we have is a great process. As an MC, I never come in with lyrics and then make the beat. It’s always about making the music first, hearing what the music says and then fitting the right vibe into the music. I’m pretty minimalist in regards to rapping, I don’t rap over everything. Drew cannot get me to do a third verse on a song if I think two verses is what it needs. Drew says the crafting is really important. If we start an idea or Ty will bring in a beat on the (Akai) MPC, we’ll build it together, he won’t put any lyrics on it for ages. He’ll be like, Drew, it’s got to be right, you know, the kick’s not there yet, or this isn’t right, and we’ll just keep working on it and plugging away until it’s at that point where he’s like, OK, now it’s my time to sit in the back and write the lyrics out. It’s those lyrics that have helped earn Ty an army of fans across the world - they really are very special. Ty’s tracks are galvanising, insightful, and incredibly crafted. He thinks that rap lyrics can sometimes be seen as an afterthought, but that’s not the case with his work. I think what I try and do is respect the art form. I try to put on a cravat, as an MC I put a suit and tie on, as an MC I dress up, I brush up my boots. I put my scarf on a certain way. I’m actually trying to have a particular type of swagger, it’s like, I’m getting married, every day I go to make music and rap. It’s an event, and I try and treat the process of writing with that amount of seriousness. In this society, we really belittle the process of someone being able to write lyrics and actually be engaging and have a thought process. I try and look on it like I’m trying to capture the hearts of grannies, I’m trying to capture the hearts of kids, wayward people, people that don’t have any interest, I want them to turn round and go oh, did he just say ‘euphoric’? Oh, I didn’t expect that from a rapper, maybe I should listen. Ty challenges popular assumptions and even rap culture head on in one of his tracks, and thinks about how it affects kids. 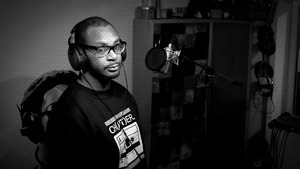 “Nonsense rap” is a term Ty uses for some of what gets put out by other people. With Like You Never, that was a critique of the situation from inside and outside, and also it was a grown up critique, so it’s not just an MC ‘I’m better than you, wipe my shoe, hoo hoo hoo,’ it’s not that, it’s more like, OK kids, listening to you, not sure about that. I’ve got godchildren. That song was more about me critiquing the situation for everybody, and there’s a lot of people that don’t listen to rap, don’t understand that it’s been influenced by corporate America. They don’t understand that, they think oh, people are moaning, but no, corporate America has actually got involved and said, no more conscious rap, only nonsense rap, and now we look at it and everybody’s like oh, too much gangsta rap and I’m like no, no, it’s corporate America created that. Corporate America endorsed that, and that’s what I’m saying in the record, I’m allowing people to understand that the stakes are high. The powerful yet simple video was filmed in San Nicolas, on Aruba, an island in the Caribbean, while Ty was teaching at Art Rules Aruba, and Like You Never has had a great response around the world. Considering it was just a song that most record companies would tell you it’s too slow or, you know, it’s not danceable enough, the feeling I get when I play that song live and people are just, uh, get into it, I’m like, see, we should never be listening to those people in the first place. And that’s what Like You Never really is about. It’s a rebel song but it’s a rebel song for everybody. It’s not a song that should be. The only people who should be intimidated by that song are the people that are actively getting up in the morning to actually control and douse the flame of what hip hop music can do. Those people should be worried. Other than that everyone else should be listening and just bobbing their head, doing the monster dance. Yes! Ty and Drew have a studio that is crammed with incredible kit, both vintage and new. They gave us some amazing insights into how they put their tracks together, by taking us through the making of Playing with Fire. 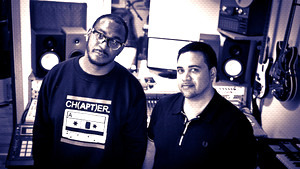 The track features rapper and poet Akala, and rap and grime MC Durrty Goodz, as well as keyboard guru Amp Fiddler. Playing With Fire is a hypnotic track off the Kick Snare And An Idea Part One EP. The initial drum parts come from the MPC and then we’ve got a sample loop that we play around with. Amp Fiddler plays keys. It’s a swingy, happy, fantasy kind of record with us doing double time over it. It’s kind of a loping, leading beat. We didn’t programme it so that it would have too much going on - the vocals would be the thing that walk all the way round it. Ty and Drew say that the notes are played behind the beat, and Amp Fiddler is playing their favourite Fender Rhodes keyboard. Amp Fiddler is a soul and funk musician who has worked with everyone from Prince to George Clinton and Primal Scream. Leading jazz/soul singer Julie Dexter is on backing vocals, and Ty plays glockenspiel. It was about building up the atmosphere, The sample’s already got a particular melody - we’re trying to build it up and have elements there that just made it bigger. Their Korg MS-20 also features, with heavy filtering that makes it sound a bit like a theremin. They called the sound ‘Spooky Korg’! The beat is very static because I knew the rapping would be all over the place, all over the music, it just needed to be lolloping so the rap could fit in. I really find with production sometimes there’s a lot of overproduction. The producer does everything so the rappers just have to rap and it’s like really sometimes it’s just nice to create a soundbed where the rap has to then move the song. And that’s what we did. Ty compares overproduced tracks to athletic chaos! To me it’s like running a hurdle race. But actually you didn’t sign up for the hurdles. You signed up for a straight 200 with no Usain Bolt, you expect to win. And then all of a sudden you just get a bathtub, a giraffe, an elephant, you ‘re in a barnyard, all these things you’ve got to jump over just to run the distance. It’s important sometimes just to create space so that people don’t have to jump over stuff all the time vocally. I think as bedroom producers, it’s very easy to just sit home and because no one else is with you, you can just make the music and do everything and then create every nook and cranny and what you don’t realise is actually you’ve seasoned up the chicken so well that even the chicken doesn’t want to jump in the oven and get cooked. The chicken’s calling you jerk, like why would I jump into this oven? You’ve done everything. So it’s about space and just giving a bit of time for certain things to kind of hop off and happen. That’s why we collaborate and do certain things a certain way. And that… is magic. Drew says creating space is something he has learned from Ty. He’s taught me how to listen out for spaces in the song, because often in the past I may have overplayed synths or keyboard parts and you know there’s actually no space or room for any vocalist to actually sit on it, so it’s quite a valuable thing to learn. We’d heard that Ty is hoarding vintage MPCs and we had to ask him just how bad his MPC addiction is! I have three of them! The reason why I love this drum machine is because it has a particular sound, it’s quite crunchy but it allows me to do enough things, it allows me to work alongside Drew. We can programme stuff and then develop it as we go. The MPC comes from a long range of many different versions so there was the MPC60 then there was the MPC60 mark 2, then there was the MPC3000. So this was quite an early version. Then there was the 2000 then there was the 2500 then the 100 then the 50, 59, 99p, you know, there’s all of those. But this one here, there’s something about it, just something that feels classic to me as far as the type of things you can do and get beatwise before you then click in with Logic and add those things. 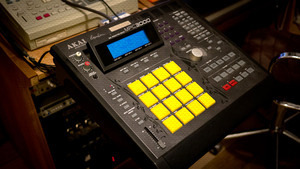 The MPC is my kind of apparatus that I talk with my hands with, as far as our collaborations go. The MPC is not the only thing they use for beats. The studio has a number of vintage drum kits from the 60s through to the 80s including Olympic and Premier, as well as a new Sonar kit. 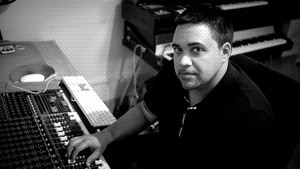 There are plenty of musicians and real instruments on their tracks too, including leading jazz / hip hop / dubstep drummer Richard Spaven. We’re not afraid to mix live musicianship with a hip hop beat to get a little bit of movement but then to still make solid beats. Richard Spaven has a way of playing music where it’s like, he brings a hip hop-ness to the way he does the sound when we do it live and that’s why we used him on Well Well Well because he just, Richard understood and I think loads of drummers understand but it’s about, it’s not just about having a live musician on your music, it’s about having a live musician that understands and plays the right thing for you to then manipulate for the way that you need it to be. We couldn’t resist asking why Ty references the Linn Drum in his track Like You Never. With Like You Never, when I mention the Linn Drum in the third verse, what I’m doing is I’m really referencing a style of music that has become a mainstream music right now, from America, where they use the electro Linn Drum sounds as the general sounds for the drum kit. To me at this moment in time that style of music reminds me of lazy production, it seems like people are very formulaic with it. I do use it, we flip around, we play around. I love the drum machine I just don’t like the way people are using it right now. It’s very cheap, very follow-fashion, very weak. Very whack. Ty and Drew favour one particular mic for their sound, as Drew explains. The mic that we use mainly for recording Ty’s vocals is a Neumann TLM 103 and I really like this mic, it’s my favourite mic. I love the sound of it, it’s got a slight EQ push. I always use it with a TLA voice processor. It’s an Ivory Series, and has a built-in compressor. The combination just really works. It doesn’t always work on every rapper or singer but for Ty’s situation it really really works. At the heart of the studio, we use Logic. I like to use a really good sound processor, an audio interface, we use an Apogee Ensemble. We went for a Toft 24, a Toft ATB console which is an analogue console and it’s based on a console from the 70s and that gives us the sound we need to compliment the synths and the MPC and everything else. The Toft was designed by Malcolm Toft and based on his design of the Trident Series 80 Console. There’s a full list of studio gear here. Ty and Drew have an incredible vintage keyboard and synth collection - it is something they both feel passionate about. Drew gave us an overview and we filmed him playing some of his favourites. The kind of synths we have in the studio, we have a Minimoog, we have a Fender Rhodes electric piano, we have a (Hohner) Clavinet, we have a Solina, we have a Compuphonic, which is a Roland Jupiter-4, there’s a (Korg) MS-20, there’s a Korg Vocoder, sitting behind us, there’s an OB-Xa, which is Oberheim, there’s a Vox Jaguar sitting next door and there’s a whole load sitting in Ty’s house as well. Here we have a Fender Rhodes electric piano, it’s a 73 key Mark 1, it’s a stage piano, and it’s an electro-mechanical keyboard which means it has moving parts, it has hammers that hit tines, that give it its kind of bell like tone, and this is my favourite keyboard of all time. This keyboard helped me to play, actually taught me how to play the keyboards. I used to listen to records and try and mimic the sounds on there, and I used to pick out chords. I used to play until I was literally falling asleep, I just love the sound, it’s something that you cannot get on any plug in. There’s plug ins that have tried to replicate the kind of sound and have multi-sampled it, which are pretty good but there’s something about the kind of after-touch that you get from playing a weighted keyboard like this and obviously the sound you get from it. It’s quite creamy, quite a smooth sounding keyboard but the low notes have a bite so you can get some really cool bass notes from it. You can put it through guitar effects, you can literally make it sound like it’s another keyboard and it’s a one of a kind. 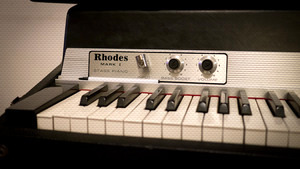 Every Fender Rhodes actually sounds different. Ty admits he’s addicted to eBay, and says that he and Drew are kids at heart, always collecting and tinkering with kit, especially keyboards and synths. We have a fund for acquiring them, for fixing them. We’re interested in analogue stuff. 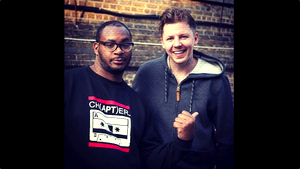 Me and Leroy Brown, one of my DJs, we went to LA and we were trying to figure out how to get this big-arsed keyboard back on a plane without charges. We thought about making our suitcase a coffin. But we didn’t do that. Generally, our interest with electronics far outweighs just the production so we’re interested in the filters, we’re interested in guitar pedals we’re interested in just anything that can make something sound funny. Drew says the collection can get quite diverse! Over the year’s Ty’s collected a number of synths, he likes collecting gadgets as well. He’ll buy a Speak and Spell which has been modified and it’s got all of these different knobs to make different sounds. You’ve got an Omnichord. It’s confession time for Ty. I guess we’re just analogue geeks, there’s something about these synths that just sound nice and rich and warm and you know it just has a particular sound. Each synth has its own characteristic, like a Moog filter will sound different to a Korg filter. I started buying synths and stuff because I knew I wanted that sound. I mean we’re all seventies babies and we’ve all grown up with the amazing sound of synths and progressive rock and all those things in pop music, in soul. There’s an understanding and a love for this sound, because of all of this music, whether it’s Slade, whether it’s whoever. Synths and what they do have always been something that to me have just been so catchy, so interesting and so inspiring. Then when we have the opportunity to buy the synths and you compare them to the plug ins, no way. There is a special quality to their tracks, and they are always getting asked about it says Drew. People have turned round to us and said you know look, how do you get this sound, what is it about this sound? What’s going on behind that? A huge part of it is the analogue synths that we use on the record, it’s quite an integral part of what we do in terms of making music and the whole process. You can just hear that, whether it’s the person playing bass on it, whether it’s us playing synth bass on something or whatever sounds we use, just something that makes it feel that it’s not just a keyboard sound from a computer-generated programme. It’s got a life to it, it’s got a dirtiness to it that we are proud of. I’m not saying to anyone else you can’t get a dirtier sound with a synth plug in, of course you can, but over a long period I think our records have proven if you go and listen, that we’ve got something going on with our usage of live synths. 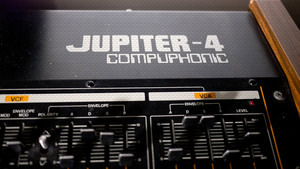 One of their key synths is a Roland Jupiter-4 Compuphonic, which came out in 1978. It’s really good for pad sounds and it’s got an arpeggiator on it so it allows you to create sequence sounds. There’s a memory built into this so if you make a particular sound you like you can store it. There’s also some presets on there as well so it’s a really nice basic synth. It’s actually recommended if anyone wants to get into real analogue synths, it’s quite easy to pick up. We really like it, we’ve used it on a number of songs. A Korg MS-20 from the 70s is another key synth. It’s one of our favourite keyboards, I mean we have lots of favourites here but it’s one that gets turned on quite often when we’re making music. I like this particular synth because you can patch it up if you look up the patches on line, we have a book somewhere with some examples of patches which create some really interesting sounds. I’m sure people are well familiar with the kind of plug in version of this but this is the real thing, and it has quite a unique sound. I like it for bass sounds, for lead sounds. You can also plug an external signal in so you can process a sample or another keyboard. I’ve had bass players in here where they’ve plugged into the signal in and patched it up and you can actually trigger the synth by a bass guitar, which also gives it its own unique sound. So we have some quite nice filtered bass sounds. It’s monophonic which means you can play one note at a time. It has all the general filters of an analogue synthesizer, it’s got a low pass filter. What’s unique about this is that this has a high pass filter as well so you can filter out other frequencies, you have resonance, you have a frequency modulator which allows you to bend the note. It has two oscillators so you can blend the two, you can actually detune one. There is more info on Ty and Drew’s The Lab Recording Studio synths here.